If your backpacking stop in Cracow really bowled you over, you may want to find out more about the curious country that is Poland. And luckily enough, there are several intriguing options to do so for those with a thirst for knowledge about all things Polish, and indeed the wider orbit of Central Europe. Cracow is home to a veritable galaxy of academic institutions. 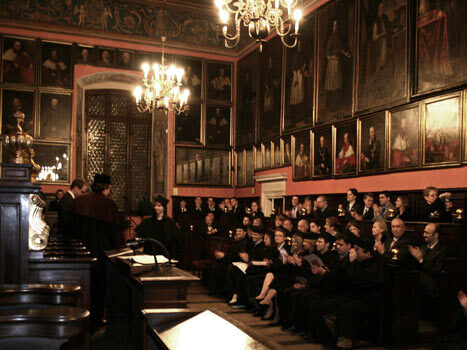 The most prestigious is of course the Jagiellonian University itself, founded all the way back in 1364. After Prague's University, it's the oldest university in Central Europe, as no doubt you've been told by all and sundry. The Jagiellonian offers some interesting MA programmes in the English language, whilst if you're from a Polish family in America, Canada, England or indeed anywhere else on this barmy planet, Cracow is your oyster so to speak - or your pierog if we polonize the expression. Besides the Jagiellonian itself, several other academic institutions offer courses or exchange programmes for foreigners. These include the long-standing Academy of Fine Arts, the School of Medicine (also joined to UJ), as well as the architectural faculty of Krakow's Polytechnic. Of course, the old rivalry with Warsaw extends to academia too - and that young upstart of a city does indeed have some superb academic institutions; many are the best in the country. However, in terms of a congenial city to actually live and study in, Cracow, with its laid back charm, may be the more tempting offer. Students are sure to enjoy researching the peculiarities of Cracow's bar scene, as well as the epicurean merits of the leading Polish ales, Zywiec, Okocim and Tyskie. Distinguished Institute founded in 1955. Founded 1912. Courses for foreigners. The grand old man of Polish academia. Ever-improving courses in English and numerous options for ex-pat Poles, the centre now offers an MA in Transatlantic Studies. There's also the Institute of European Studies, which offers MA within the Euroculture Programme. Prestigious institution. Architectural faculty has popular exchange programme for foreigners. Many great figures have been associated with the enterprise, including former director Jerzy Grotowski. Named in honour of the great painter Jan Matejko. Wyspianski, Mehoffer and numerous others taught and studied here. Has the best view in Cracow, and the standard of musical excellence is equally lofty. One of the most distinguished in the country. I am a graduate student in Art History at the Universisty of Illinois in Chicago. I'm enquiring about any art history related conferences you may have between now and Octobe 2011.
i am M.Sc. in food science and technology and want to get admission in Ph.D.in food science and technolog,please give me information abot what are the procedure of admission and what are the finincial support for international students. plz give me me info. thanking you. hi eveyone! Looking for a good univercity with foundation (language programme) Any good recommendations? Any info would be apreciated! :) Thanks! Hi, I'm about to finish my master in Portuguese and Latin American Studies and I'm keen on living in Poland, near Krakow. Please tell me if I need to take any further courses in order to teach my subjects in Krakow's university, and do I need speak Polish in higher level? I do speak Portuguese and English. I need some help badly. I am spending 9 days in Krakow from 22 FEB - 03 MAR, 2010, with the specific aim of discussing Polish politics and the EU. Any suggestions? hello, i like to get scholarship in your school for M Phil in math . have any chance to apply for scholarship? good information,now can somebody help me find my greatgrandfather, a professor of languages at your university around 1860-80. His name was Josef Krol. How much would someone charge? I am a student of BBA, my institution is Northern University which is stuated in Bangladesh.Recently I have completed my BBa degree.Now I want to admit a fiancial academic instituion in England By the scholarship which institution is the renown for the finance. because i am heartly like to read on the subsect of finance. I work English guide in Egypt since 9 years. cos the number of english guides getting increase every day that i decide to study another language.I choose to learn polish language.if there any possibility tl study polish at Cracow Academy. plz inform me . thanx for help. I have completed my M.Sc degree in Environmental Science. I want to continue my study further in Poland. If there are any possibilities to do so please inform me. I graduated from the Akademia Medyczna in Crakow '83 and am returning to this magnificent city for our 25th reunion this week. Hope to see some old familiar faces ! I'm really interested in Cracow universities and I would like to know weather there is any university in english and how can I apply becouse most of the faculties webpages i'm interested in are in polish.Thanx! I deal with studying Polish on university in Krakow. Is there any possibility that I get some more infromations about it? Are there any international class or do I have to know Polish? I am a student from macedonia and I am interested in The Jagiellonian University, can you send me some more info via e-mail? Thanks in advance. I am smilism school leader.I enjoyed your site.I am from Iran an dI would like to get familiar with the way Farsilanguage is taught for student of IRANOLOGY. I f possible I would like to have some students emails addressessto cantact with.I am waiting. please l will like to recive information on when 2008/09 seasion application form will ready. which is the Art University in Krakow?You should study also grafica and video-making as well. thanks 4 info.